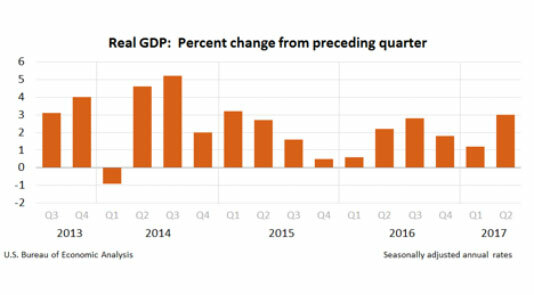 The second estimate of the U.S. GDP annualized growth rate for the second quarter of 2017 was 3.0%. This was a much sharper increase than expected and a significant increase over the first quarter annualized growth rate of 1.2%. This was the highest annualized growth rate since the first quarter of 2015. In July, the Federal Reserve Bank noted that “consumer spending was sluggish in the early part of the year but appears to have rebounded recently.” Sure enough, the personal spending component surged 3.3% and contributed 2.28% to the annualized growth rate. However, regardless of the sharp increase in growth, one of the inflation indicators watched closely by the Federal Reserve Bank, the core personal consumption expenditure price index, was relatively benign. Many economists have called this type of scenario a Goldilocks economy where economic growth is moderate and inflation remains low. As noted in previous economic commentaries, the current economic expansion is now among the longest expansions seen over the past 100 years. Furthermore, credit outstanding in many areas has expanded to levels seen in 2007 and, in some areas, has exceeded those levels. For certain consumer credit sectors such as automobile credit, there may be signs of fatigue as total U.S. auto sales may have peaked in recent quarters and automotive companies have stepped up incentive spending sharply. Further credit growth and performance at all levels will bear watching as one indicator of further economic expansion. In addition, the U.S. President’s agenda continues to include a tax plan overhaul that could provide fiscal stimulus to future economic growth. However, this has become less certain than many had initially anticipated, but remains worth watching as a potential future economic stimulus. In addition to the above considerations, recent weather calamities will undoubtedly cause ripples in economic growth over the coming quarters that will add to the uncertainties of continued economic expansion. Nonetheless, following the September 2017 FOMC meeting, the Federal Reserve remains comfortable with the economic growth outlook at this time, and the relatively muted level of inflation allows for a slow pace of increases in the Federal Funds target rate. Following this meeting, markets are now expecting approximately a 64% chance of the next increase in the Federal Funds target rate to occur at the December 2017 meeting. Three increases in the target rate are now expected in 2018. In addition, the FOMC confirmed that they will begin gradually reducing the Federal Reserve Bank’s balance sheet in October to provide a very gradual pace of additional monetary policy tightening. Many have said throughout the years, don’t fight the Fed. Based solely on this adage, if the Federal Reserve is communicating higher interest rates in the future, then that should be your base case. However, we remain watchful of the U.S. Treasury yield curve as longer-term yields remain range bound and as of yet have not followed suit with the 100 basis points of increase in the Federal Funds target rate. Is the U.S. Treasury yield curve telling a different story or is it only a matter of time before it is communicating the same story? What happens to those longer-term U.S. Treasury rates if economic growth does falter or some other event causes U.S. Treasury yields to fall? Following the Federal Reserve’s FOMC communications is certainly a reasonable approach. However, given the other considerations, it is certainly a risk manager’s function to consider other plausible possibilities.